This seems to be a great year for lady beetles in Colorado, or at least their outbreaks are getting a great deal of press. There are some regions along the Front Range of Colorado that have seen massive outbreaks. There has been a great deal of chatter among the public, landscape and horticulture professionals, and university faculty about these observed outbreaks. To clear up some mis-conceptions and provide the facts, Dr. Whitney Cranshaw,Colorado State University Extension Entomologist has provided the following explanation. In parts of eastern Colorado extremely large numbers of lady beetles are being observed. Their numbers even prompted a June 18, 2009 note on the front page of the Pueblo Chieftain, and the southeastern counties appear to presently (June 19, 2009) have the highest numbers of lady beetles. Rainfalls wash off the honeydew that aphids excrete, which is used by lady beetles as a supplementary food and a means to locate their aphid prey. Heavy rain falls may also dislodge some of the predators. Cool temperature retard the development of predators in relation to the aphids. Although all insects are “cold-blooded” and develop in relation to temperature, the predatory insects usually have a higher base temperature requirement for activity. That means that cool temperatures slow down the predators quite a bit more than their aphid prey, allowing the aphid populations to largely escape predation and their numbers quickly soar. Aphids can occur on a very wide variety of plants. Indeed it is hard to find any plant species that does not support one or more of the 350+ species of aphids that occur in Colorado. Oaks, lindens, walnuts, poplars, Norway maple, and most stone fruits are among the trees that often support large numbers of aphids. Spirea, roses, and many flowers can be common aphid hosts in spring. Weeds may now have large numbers of aphids, such as Canada thistle. Furthermore there are a great many native plants where aphids may be abundant; sage is currently supporting tremendous numbers of aphids - and developing lady beetles - in southeastern Colorado. Ultimately, the predators do catch up. And because large numbers of aphids are present, large numbers of lady beetles are then produced. In the case of many areas this year, truly extraordinarily large numbers of lady beetles. The most common species of lady beetle presently associated with the spring aphid bloom, by far, is the convergent lady beetle (Hippodamia convergens). A distant second is the seven-spotted lady beetle (Coccinella septempunctata). Green lacewings are also common predators consuming aphids at this time. What will happen next? 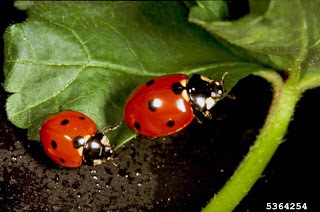 Lady beetles are general predators, although aphids are their preferred host. With the large numbers of lady beetles present they should largely annihilate most every aphid over the next few weeks. They will also incidentally consume some mites, scale insects and perhaps some eggs and young stages of caterpillars and leaf beetles. These types of insects may also be suppressed. But soon there will not be enough food for the lady beetles to continue to sustain themselves and reproduce. So they will then likely “check out” out for the year. At some point every season lady beetles go into a condition known as diapause where they stop reproduction and slow metabolism. It is in this diapause condition that the insects survive winter. So most of the lady beetles, at least most of the convergent lady beetles, may decide to call it quits for the season and go into their winter dormancy earlier than normal, perhaps by mid-July. The convergent lady beetle is the species that does migrate to the high country for the “off-season”. Hikers may see masses of these lady beetles near prominent points in the foothills and mountains along the Front Range during summer and early fall. Of course, if the predators largely vacate, that may again open up a late season opportunity for the aphids to rebound. But so much can occur between now and then for this to be very predictable. Two Colorado State University Extension Fact Sheets that may be useful references are 5.594 Lady Beetles and 5.511 Aphids on Shade Trees and Ornamentals.